Both Leo and Scorpio have a strong character, but in Leo it appears brighter. Scorpio rather belongs to the natures, which they say "in the quiet waters of devils are found," but it’s worth to touch him for a living, and all the secret will become obvious. The similarity between Leo and Scorpio manifests itself in their propensity to transform life into a theater. Leo does this because he is an artist in his heart, life is for him a scenario of the play in which he plays the main role in luxurious scenery. A Scorpio can be the secret king of the drama - he is inclined to extremes, and therefore it is very difficult to convince him not to make an elephant out of the fly, because elephants are much more spectacular. When Scorpio and Leo live together as a child and parent, the rest of the family gets first-class tickets for one of the most exciting performances they’ve ever seen - in ten minutes it can turn from a thriller into a comedy or tragedy. When the Lion and the Scorpion are able to restrain themselves, they come together. The less they demand from each other, the more they get in relationships, and once they understand how to avoid the debilitating war that they inevitably enter into, they will agree on a truce. Leo mom has a generous heart, and her little Scorpio feels surrounded by love and attention. She understands the feelings of her child well, up to his need for solitude, although she herself has a different opinion on this matter. She is open and sociable, and she likes to be in the center of attention, surrounded by people. Her Scorpio-child is not always contact, especially with those who are not too trustworthy. If he does not feel safe, he may never reveal himself. Mother teaches the child of sociability, although it would be calmer if the mother showed it to her numerous friends less. Lioness can persistently push Scorpio to success, because she feels wonderful in the rays of the glory of her clever child. Well, Scorpio does not need pressure from outside - he himself is ambitious enough and will do everything possible to achieve his goal. For him it is more important that he has the freedom of choice and there was as little time as possible to dig into his own feelings. Well, next to the energetic and sociable Lioness of time for doing nothing, he will not! True, this mother sometimes begins to show too much of her power, but Scorpio does not like it. And if you do not give him the opportunity to go his own way, he can give out a flash of anger or depression in response. Impulsive Lioness seems at times Scorpio too unpredictable. This child loves to know exactly what is expected of him, and prefers to live according to rules known to him, and Mom-Leo is so happy about everything unexpected that she does not need to change her schedule for the sake of a new entertainment. She is eccentric, original, full of humor and adores applause. But a serious little Scorpio is not always tuned to such a performance. But her wise advice will impress him with her deep meaning. And in general, next to this mother of the Scorpion child awaits such a bright childhood! Leo dad draws everyone like a magnet. And no one doubts his power and authority! Scorpio likes it, because next to his father, he feels safe. And he respects his father for the fact that he always knows what to do. True, the Lion should not be a dictator, especially with this child: Scorpio can rebel, close in his room and even think about revenge. And in the end he is able to achieve his own! The father should not place too much hope on the little Scorpio. The child already wants a lot from himself, and the additional pressure of the father can only cause him anxiety. 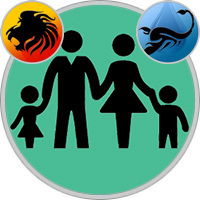 Scorpio rejoices at any opportunity to help his father, so that all family decisions are better taken together. In addition, the child likes to think that he is in some degree the master of his destiny. Scorpio needs emotional support, and father, it works out. There is so much warmth, caring and understanding in him that they can not have no close friendships. Father will be happy to answer the numerous questions of his curious Scorpio and of course he will be proud that his child has such an acute and inquisitive mind. Leo condescendingly accepts the adoration of his offspring, and Scorpio sometimes uses it, flattery seeking from his father a lot. Leo’s confidence is so strong that it is transmitted to his child, helping him to feel happier and prosperous. Little Scorpio would like to occupy a special place in his father’s life, but this does not work, because there are too many people around Leo and he does not always have enough time for his own child. But if this time is found, no one will love Leo more faithfully and hotter than his Scorpio child.